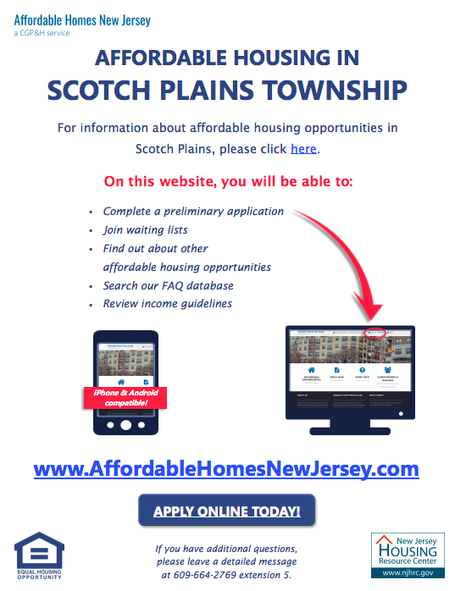 For information about purchasing or renting an affordable unit in Scotch Plains, please visit www.affordablehomesnewjersey.com. See current listings of home for sale and rent. If you have additional questions, you may leave a message at 609-664-2769, ext 5 or email homes@cgph.net. 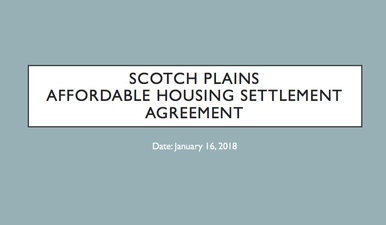 Please click here to view the Settlement Agreement Between the Township of Scotch Plains and Fair Share Housing Center January, 2018. Township Planner Michael Mistretta of Harbor Consultants presented on the Affordable Housing Settlement Agreement in front of the Township Council at the Council Business Meeting on Tuesday, January 16. The affordable housing or Mount Laurel doctrine, started with the 1975 decision by the N.J. Supreme Court involving the Township of Mount Laurel (So. Burl. Cty. N.A.A.C.P v. Tp. of Mt. Laurel, 67 N.J. 151 (1975) or “Mount Laurel I”). In Mount Laurel I, the Supreme Court decided that under the State Constitution, each municipality “must, by its land use regulations, make realistically possible the opportunity for an appropriate variety and choice of housing for all categories of people who may desire to live there”, including those of low and moderate income. Thus, the Mount Laurel I decision prohibits municipalities from using zoning powers to prevent the potential for the development of affordable housing. Click here to download the full document with the entire background and history of Affordable Housing.